The one stage synthesis technology of Ni aluminides as well as REM aluminides containing complex modifier of the ACCA (wt.%: 30-33 Al; 28-30 REM; Ca 3-4; the rest being Ni) has been developed aiming at modification of aluminum alloys (Al-Si and Al-Cu). The A95 melt is superheated to 1400 °C in an atmosphere of pure argon and it is alloyed by a complex ACCA modifier in the amount of 50-60 wt.%. When using these additives the alloy A95+ACCA with intermetallic compounds of Ni and REM is synthesized. The stoichiometric formulae of Ni and REM aluminides have been determined. For high-strength cast iron there have been developed master alloys from rare-earth metal (Ce, La, Y) aluminides with a melting temperature of 720…780°C ensuring production of thin-walled castings without chill. Key words: Ligature, nickel aluminide, REM aluminide, solid solution, eutectic, atomic percentage, stoichiometry, temperature. The complex dynamic Seiatsu-process model on the forming machine is constructed and computer modeling is carried out him. The mechanism of consolidation of mix is specified and it is established that the major condensing factor is the air pressure impulse over the free surface of mix, and the stream of the filtered air has important, but nevertheless auxiliary value. Key words: Settlement scheme, impulse, air stream, consolidation. Influence of the polluted surface layer of samples and models from titanium alloys on the maximum strength and limiting plasticity is investigated. Tests were spent on specially developed models and samples. Key words: Titanium alloys, strenght, plasticity, polluted surface layer. The article considers one of the most common defects that affect casting obtained by the technology of casting on gasified models, studied the prevalence of the considered defect and the impact of its availability on the complexity of finishing the castings. In the absence of the description and classification of this type of defect in the literature, formed his title – localization of the liquid phase, the original description of the mechanism of formation of this type of defect. Conducted research casting, are afflicted with this defect, propose specific technology recommendations to reduce the probability of formation of defect localization of the liquid phase. Key words: Casting on gasified models, the localization of the liquid phase, metal, defect, casting, polystyrene foam, model. The article describes the effectiveness of switching to shell mold casting. It is determined by comparing to various other variants of making castings. Use of a synthetic resin as a binder for making molds and cores was a great step in enhancing the efficiency of casting production, reducing materials consumption. The application of resin-bonded sand improved the mold and core quality, reduced the production cycle, lowered the labor inputs and also fuel-and-energy costs. Key words: Deformation, resin-bonded sand, creep kernel, temperature, pulverbakelite. Examination of the possibilities of reclaiming polystyrene foam pattern waste using various solvents showed the expediency of replacing turpentine oil with another solvent. Key words: Polystyrene foam, waste reclamation, solvent. Discussed are the principles of mathematical simulation of foundry processes, as well as the possibilities of the modern software products. Key words: Simulation, computer software. Discussed is a technology of casting Cu alloys in gypsum-silica molds. It is pointed out that the process may be used as a base for a technique of making filigree art items. 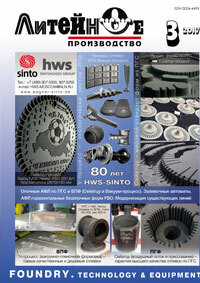 Key words: Art casting, gypsum-silica molds, technology, castings, quality.